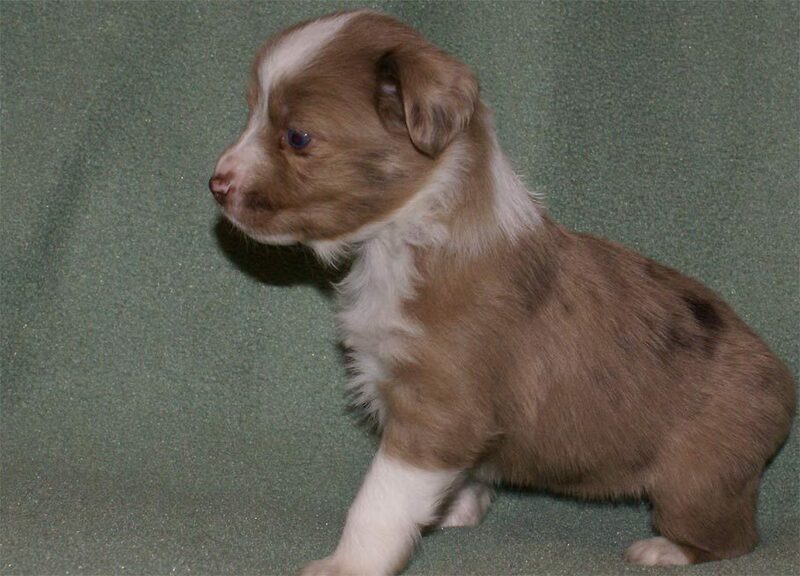 Available Mini Aussie puppies from January 2009 at Breezemore's Maine Miniature Australian Shepherds. January 2009 New Miniature Australian Shepherd Puppies! Jazzy and Eli had a new litter of seven puppies (6 females and 1 male) on January 2nd. You can e-mail me at breezemore@gmail.com for more information, questions or pictures. A copy of our puppy contract can be downloaded here. As always, this litter of puppies is N.S.D.R eligible. All the following pictures were taken on either January 27th or February 3rd, right around 3 1/2 to 4 weeks old. We have a video on YouTube of this litter playing together at 5 weeks old here! She is the smaller of the black tris, but well proportioned. Her copper is showing up beautifully and she has a wide, nearly full, collar. Sold, Thank-you Aly. She has named her Gracie! She has nice bones, she's a very solid and heavy built pup. She's a very active pup, she love to play and interact with people. Sold. Thank-you Bowdens, They have named her Cricket! A nicely built pup whose copper already has great contrast. She's sweet as can be and loves to be held. Sold, Thank-you Erin. She's named her Rosie! She's a nice dark red, a lot like her mom (Jazzy). She hasn't any copper, and minimal white. She is sweet and likes attention, or alternatively, she loves to lick. Sold. Thank-you Brenda. She's named her Chance! Her eyes may end up being blue. She has nice copper trim and is a quiet pup who loves to be held. She's a nicely marked pup with very light merling. Her eyes look to be blue. She a very solid pup, she's the largest of the females. He's a very personable pup; he loves to play but settles down well. He seems to have either blue or green eyes. He has a wide blaze that extends down his neck giving him a wide partial collar. Sold, Thank-you Christal. She has named him Teddy!